Russell Knox is up a spot to 18th in the world after starting the new PGA Tour season with three consecutive top-10 finishes. The 31-year-old also jumped 13 places to eighth in the FedEx Cup standings after claiming third spot behind American Pat Perez in the OHL Classic in Mexico. Knox, who lost to Graeme McDowell in a play-off in the same event 12 months ago, signed off with a 66 for an 18-under-par 266 total at Mayakoba. “I played really well,” he said afterwards. “I wasn’t all that comfortable out there as this course could of makes you put the steer on sometimes. Knox picked up three shots on the spin from the fourth before giving one back at the ninth. He then birdied the 10th, 11th and 13th, bogeyed the 14th before repairing that damage with a 3 at the 16th. Knox now heads to Australia to team up with good friend Duncan Stewart in the World Cup in next week’s World Cup in Melbourne. Knox, who finished a career-best 10th in last season’s FedEx Cup, started the new PGA Tour season by tying for 10th in the CIMB Classic in Malaysia then claimed a share of ninth in his defence of the WGC-HSBC Champions title in China. Pat Perez, who missed his eight months due to injury, closed with a 67 for a 263 total, winning his second PGA Tour title by two shots from compatriot Gary Woodland (70). Colin Montgomerie missed on two fronts despite giving it his all in the final event on this season’s Champions Tour in Arizona. He finished third behind American Paul Goydos in the Charles Schwab Cup Championship and was also pipped by Bernhard Langer in the money-list race for Charles Schwab Cup. When Montgomerie birdied the eighth on Desert Mountain’s Cochise Course to move to 11-under for the tournament, he led Langer by two strokes. However, the big Scot parred the next six holes in a row, allowing Langer to overtake him as he claimed the Charles Schwab Cup for the third year in succession and fourth time overall. Goydos closed with a four-under 66 to finish on 15-under 195, claiming a wire-to-wire win by two shots from Langer, with Montgomerie a further two shots back. In finishing second on the Charles Schwab Cup, Montgomerie earned a $500,000 annuity. That was on top of the $1,723,318 he picked up during the season for one victory, two runner-ups and 10 top-10s in 22 starts. Bradley Neil is the leading Scot after two rounds in the European Tour Qualifying School in Girona. The former Amateur champion from Blairgowrie is sitting joint-19th on six-under after opening efforts of 64 and 72 at PGA Catalunya. David Law (66-71) is a shot further back, closely followed by Ross Kellett (72-66) then Scott Henry (64-75). Peter Whiteford (76-68), Grant Forrest (74-71) and Craig Lee (72-74) are all over par heading into today’s third round. English duo Robert Coles and Richard McEvoy share the lead on 10-under in the six-round marathon, which will see the top 25 and ties secure cards for next season’s European Tour. Connor Syme heads into this week’s Australian Open boosted by a top-20 finish in a profesional event. The young Fifer shot rounds of 69-68-64-73 for a 14-under-par total to claim a share of 20th spot in the New South Wales Open at Stonecutters Ridge in Colebee. Syme’s eight-under third-round effort was the best score of the day in an event won by home player Adam Blyth with a 23-under aggregate. “Lots of positives to head into next week,” said the Drumoig player, who earned his place in the Australian Open field at Royal Sydney by winning the Australian Amateur Championship back in January. Gemma Dryburgh secured a top-20 finish as home heroine Aditi Ashok recorded a fairytale win in the Hero Women’s Indian Open. Dryburgh closed with a 69 at DLF Golf and Country Club in Gurgaon to claim a share of 19th spot on six-over. Pamela Pretswell tied for 34th while Sally Watson, the third Scot to make the cut, finished 59th. Ashok, an 18-year-old rookie from Bangalore, became the first Indian player to win on the Ladies European Tour as she signed off with a 72 to pip American Brittany Lincicome and Spaniard Belen Mozo. “It means a lot to win this,” said Ashok, who underlined her potential when winning the St Rule Trophy at St Andrews in 2015. She was inspired to become a professional golfer when she watched Laura Davies and Gwladys Nocera compete in an event in her home city. She first played in the Indian Open as a 13-year-old amateur in 2011. Chris Wood and Andy Sullivan will now form England’s team for next week’s World Cup in Australia following Danny Willett’s withdrawal. Masters champion Willett had been due to team up with Lee Westwood but now Wood will join forces with his Ryder Cup team-mate Sullivan. Wood will be playing in the event for the second time in his career, while Sullivan will be making his debut. Wales have also had a change for the event in Melbourne, where Bradley Dredge will now be partnered by Stuart Manley following Jamie Donaldson’s withdrawal. Ian Poulter will make his first appearance in a regular European Tour event for ten months when he joins former Masters champion Adam Scott at the Australian PGA Championship early next month. 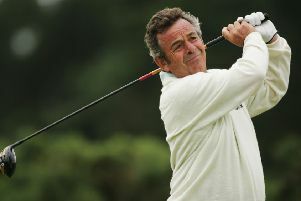 The Englishman last teed up on the European Tour in the Abu Dhabi HSBC Golf Championship at the start of the year. He missed a big chunk of the 2016 campaign after undergoing foot surgery.